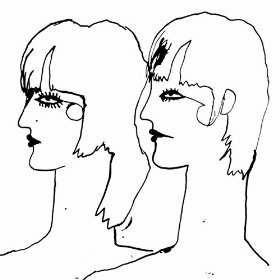 'Hermits On Holiday' actually begins in a more... well perhaps not quite conventional, but certainly less obtuse way with the poppy, strummed 'Laying Down Rock' which bears all the hallmarks of a Cate Le Bon Track, despite her partner in crime taking vocal duties. It is just about off the wall enough to indicate that stranger ideas may lie ahead. 'Focus On The Street' begins to take you there; it contains that same piercing guitar and rampant drumming, albeit more coordinated. It's the sound of a "normal" song being given to Syd Barrett to mess up for a more niche market (a good thing in case you were wondering). 'Cannon Mouth' is just as weird, with a more electronic feel and everything seemingly filtered through some kind of warp drive so that you get the impression that you're listening to it underwater. Ah, there we go... 'She Walks So Fast' is another very strange concoction, with a punctuated bassline, more scorching, meandering guitar, unusual vocal cries and statements, no set rhythm and a total disregard for what pop music, or even psychedelic music, should be like. It's an acquired taste, that's almost certain, but you have to take your hat off to them. Lead single and title-track 'Hermits On Holiday' reinserts a semblance of (semi) normality, and could have featured on Le Bon's 'Mug Museum' album. Along with 'Laying Down Rock', this acts as a kind of gateway drug to the rest of the album. If you don't usually like to be taken out of your comfort zone then start with one of these two psych-pop treats. Darker but along a similar line is 'Spilt The Beans' which again sounds like a lost Harvest 45, and that's no bad thing, in fact its a warm and lovable track despite a near monotone delivery for the first half of the song. The second half sees a significant change as over the top of the music comes what could be a host of instruments getting caught in a car crash. Naturally, on a record like this, if you have a tune called 'Cheerio' you don't put it last. There are times where 'Hermits On Holiday' recalls early Gorky's Zygotic Mynci, and the keyboards on this is one such occasion, but Presley's guitar adds a whole different vibe, and 'Cheerio' actually sounds a bit like a demo. But then the entirety of the album could be just a load of ideas thrown onto a canvas and just left there, allowing the listener to decide what to make of it. Actual last track 'Time Between' is about as close to White Fence as we get, and it also has an unfinished feel. Despite DRINKS wanting to be regarded as a single entity, there are too many times (the cover, asking each other questions...) that make it clear that you could never really consider them to be so, but that doesn't matter a jot. Presley and Le Bon sound like they had a lot of fun making this LP, and even if it only appeals to a certain tastes, everyone who does fall for its distinctive charm and jumps into its madcap universe will likely enjoy it just as much.